YourConnection Australia was born in 2007 when a need was identified for the connection of multiple digital tools for businesses. Most digital agencies only provide 1 or 2 specialised services. With businesses needing websites, email marketing, client databases, social media, marketing strategies, graphic design and print help as well as online training systems to name a few, there was no-one to connect them all in one place... and YourConnection was born! The last few years have seen a massive increase in the use of all of these digital systems from small business’ right through to large organizations. We have built a reputable connection and an amazing team of people including marketing specialists, production managers, software engineers, training specialists, app developers and sales consultants to provide the most personal and professional complete service possible. We think long term with our projects and campaigns. With happy clients such as Di Bella Coffee, The Cameron Bird Group, RC3 Global and the Australian-Israel Chamber of Commerce (plus many more restaurants, cafes and small businesses), we are committed to providing the best service possible and thats why we've been around for so long! Contact us on the form below to have a chat and see where we can work together! Thank you! We'll be in touch asap! A new website was required that was able to be updated instantly by them, without having to pay a web designer every time they wanted an update. It also needed to be mobile friendly. 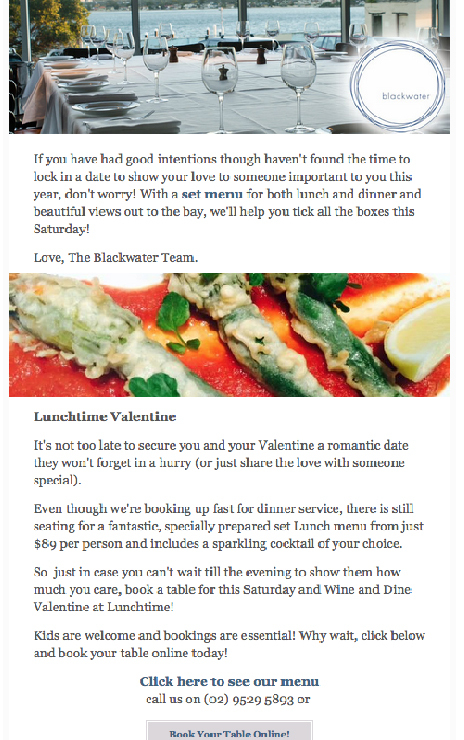 We put a managed Monthly Email Campaign together for Blackwater to interact and inform their customers of upcoming events, new menu changes and specials. There is also a dedicated link to an version for Facebook for non database members to access when they post. This email database is integrated with online forms on their website for increasing database size and taking enquiries / bookings. A report and overview of the campaign is put together each month to look at what is working and continue into the next campaign.